A new study has found that metal from the almost 5 trillion cigarette butts littered annually across the world may be leaching into the food chain. Published late last week by the online journal, Tobacco Control, Iranian scientists studied cigarette butts found on nine different beaches in the northern part of the Persian Gulf in 2015. Metal contents of the beach waters were measured twice, with a period of ten days left between measurements. Metals measured included iron arsenic, nickel and cooper. The levels of each of the metals varied considerably: from 79.01 Microgram/gram (ug/g) to 244.97 ug/g for iron and 38.29 to 123.1 ug/g for manganese, for example. Arsenic levels varied from 0.12 ug/g to 0.48 ug/g. After completing the study, scientists said considering the high amount of cigarette butts littered each year, the release of metals from littered butts may increase the potential for acute harm to local sea species and may enter the food chain. “Whereas elevated concentration of heavy and trace metals in water and soils can adversely affect some species, contamination may increase the metal tolerance of other organisms,” the scientists said. 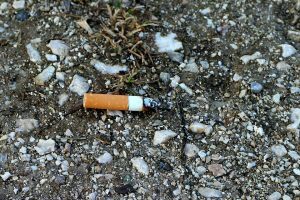 Although prior studies have suggested that metals can leach from cigarette butts, the scientists said more research is needed to fully understand the leaching behaviour. In the meantime, the scientists are however asking smokers not to litter their cigarette butts. “Enhanced public awareness about the toxicity of discarded cigarette butts in the marine and coastline areas may help to decrease the environmental hazards of cigarette butts in these areas,” the scientists said.